I’m super excited to finally get my hands on the Jaclyn Hill’s favorite Morphe Brush collection. As a professional makeup artist you’ll find your self needing at least 3 different makeup brush sets depending on the type of makeup you apply. For myself I do both beauty and special effects, so ideally I’ve always wanted to have 3 different sets. One for personal use, 2nd set for my beauty clients and 3rd set specifically for special effects makeup. I’ve been looking for a set similar to this Morphe brush collection for a very long time. Close to 4 years ago I had a brush collection of close to 200 brushes stolen from me by housekeeping at the Palms Casino in Las Vegas. Since my brushes were stolen I haven’t been able to find a collection similar to the one I had collected that is affordable. Purchasing close to 200 brushes of any kind can cost a pretty penny. I found this Jaclyn Hill collection to be perfect and affordable to start my own personal collection to complete the 3 sets of makeup brushes that I have been wanting for quite some time. I feel this will make me most efficient as a makeup artist. 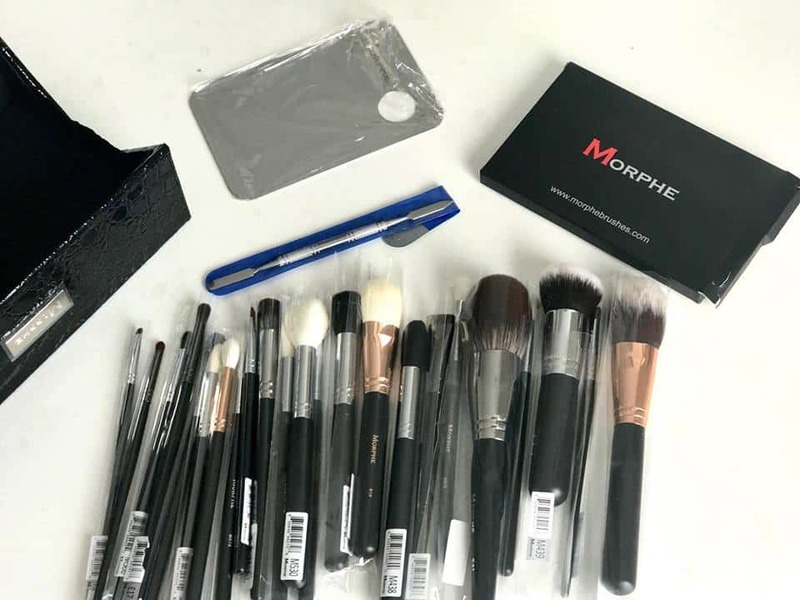 Sharing with you Jaclyn’s personal review on her collaboration with Morphe Brushes. This video is very helpful on showing you how you can use each brush. A portion of my current situation with brushes. I store part of them in cups and another part in a professional makeup brush roll. Trying to get organized to make room for my new brushes and have them nicely displayed in my home glam room. Getting all my brushes clean before my new brushes arrive. I would like to create the 3 different sets while all brushes are clean. Using this sigma express washing mat is an excellent way to clean your brushes. The ridges in the mat really helps break down all the make up product making it easiest to thoroughly clean the brushes. I washed all my brushes prior to my special delivery of new brushes. I picked this amazing Pencil Holder in Gold by Nate Berkus as part of the Target collection. It’s perfect for separating all your smaller brushes and makes them quick to reach when you are in the middle of a makeup application. I separate small angled brushes for brows and water lines or eyeliner, Fluffy crease blending brushes, small pencil brushes for inner eye corners and brow highlight. I really love this pencil holder for my brushes. A side and top visual of the Hammered Pencil Cups in gold I also purchased from Target. It’s part of the same Nate Berkus collection of $6.99 a cup. I purchased a total of 7 cups to really help me separate all my brushes by category. Powder brushes, setting brushes, kabuki brushes, contour brushes, blush brushes, eye shadow brushes, eyebrow brushes and a couple brushes for dirty brushes. I like to wash my brushes frequently to keep them sanitary and cleanest for best pigment collection from your favorite makeup products. Clean brushes also help contribute to clean and clear skin. Dirty brushes can be contaminated with tons of bacteria. I love to see space between my brushes. I’m a visual person and feel it’s easier to apply a beautiful makeup application with your tools clean and easy to reach when you are in the middle of a makeup job or applying your own makeup. I keep two to three cups of brushes on my main vanity when I’m doing my makeup or a clients. One for a set of my newest brushes and a couple cups for dirty brushes to help me separate the dirty brushes from the clean ones. Makes it easier to keep them clean and not rewash clean brushes just because all brushes end up together at the end of a makeup application depending on how organize you stay through out the makeup application. I keep the majority of my brushes right next to my makeup vanity in stack-able cubes I purchases from Ikea. I love it. Helps me store all my makeup, makeup storage containers and makeup books all in one place. These stack-able cubes from ikea is probably one of my favorites. I thought of painting it. I’ll probably do a gold rim to fuse all the colors in my glam room. The lower cubes are perfect for my makeup books and bloggers notebooks. Some randoms in one cube and the others for makeup display including my favorite makeup box by cosmocube. The first cube under my makeup brushes, you’ll find my favorite liquid lipsticks different brands but my favorites are Anastasia Beverly Hills, Stila Cosmetics and Kat Von D.
Holds nearly 100 shades and it’s perfectly for organizing them by colors, brands and sizes. This cube is right next to my liquid lipsticks. Also from Lux Boxes this incredible eyelash box. It’s perfect for storing both new and used lashes. No more lashes all over my house, they can all be perfectly stored in this box and maximize the use to each lash by keeping them in this box. Remember to always wipe down your lashes with a little alcohol on a q tip to take off any old glue and make them fresh again for another use. After I washed and organized all my previous brushes I didn’t know where to start with my new set of brushes by Jaclyn Hill. They are all so pretty, soft and the travel box is to die for. I want to purchase more of these brush travel boxes. Your brushes stay intact and don’t ruin the bristles like how some pro brush rolls can do ruin bristles if they’re not packed properly. Obsessed with this makeup brush travel box. It’s sleek, pretty, black and perfect for traveling. I love it so much. I want more of them. Now to share with you some of my most favorite from this set of beautiful makeup brushes. These are perfect for contouring. The brushes are as follows all by Morphe. These are perfect for a subtle contour and sun kissed blush. More highlight and soft blush brushes. There you have it. All my favorite brushes from this new Morphe Collection collaboration with Jaclyn Hill. I’m totally waiting on her palette to restock. I need to buy two of them. While I was at Ikea I picked up some beautiful fake summery flowers to decorate my vanity. It’s a great idea to avoid the flowers going bad and stinky water that occurs once the flowers go bad. I’m not the biggest fan of cleaning out fresh flowers every few days. I highly recommend this idea to decorate your makeup vanity as well. It will save you money and time from constantly cleaning out the dirty flower water. These flowers really brightened up my glam room. Really happy with how my DIY floral project turned out.